Scientists have studied cloud types and have realized that rain clouds are formed and shaped according to definite systems and certain steps connected with certain types of wind and clouds. 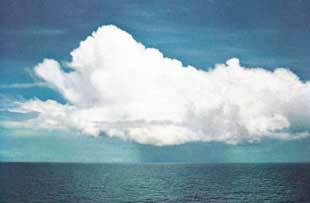 One kind of rain cloud is the cumulonimbus cloud. Meteorologists have studied how cumulonimbus clouds are formed and how they produce rain, hail, and lightning. 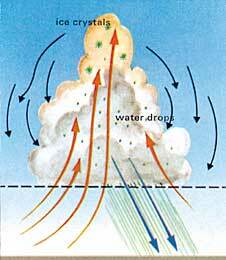 1) The clouds are pushed by the wind: Cumulonimbus clouds begin to form when wind pushes some small pieces of clouds (cumulus clouds) to an area where these clouds converge (see figures 17 and 18). 2) Joining: Then the small clouds join together forming a larger cloud1 (see figures 18 and 19). 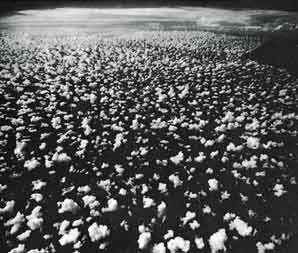 Meteorologists have found that these cumulonimbus clouds, that shower hail, reach a height of 25,000 to 30,000 ft (4.7 to 5.7 miles),5 like mountains, as the Quran said, “...And He sends down hail from mountains (clouds) in the sky...” (see figure 21 above). This verse may raise a question. Why does the verse say “its lightning” in a reference to the hail? Does this mean that hail is the major factor in producing lightning? Let us see what the book entitled Meteorology Today says about this. It says that a cloud becomes electrified as hail falls through a region in the cloud of supercooled droplets and ice crystals. As liquid droplets collide with a hailstone, they freeze on contact and release latent heat. This keeps the surface of the hailstone warmer than that of the surrounding ice crystals. When the hailstone comes in contact with an ice crystal, an important phenomenon occurs: electrons flow from the colder object toward the warmer object. Hence, the hailstone becomes negatively charged. The same effect occurs when supercooled droplets come in contact with a hailstone and tiny splinters of positively charged ice break off. These lighter positively charged particles are then carried to the upper part of the cloud by updrafts. The hail, left with a negative charge, falls towards the bottom of the cloud, thus the lower part of the cloud becomes negatively charged. These negative charges are then discharged as lightning.6 We conclude from this that hail is the major factor in producing lightning. This information on lightning was discovered recently. Until 1600 AD, Aristotle’s ideas on meteorology were dominant. For example, he said that the atmosphere contains two kinds of exhalation, moist and dry. 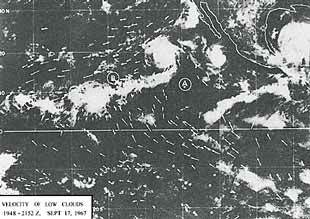 He also said that thunder is the sound of the collision of the dry exhalation with the neighboring clouds, and lightning is the inflaming and burning of the dry exhalation with a thin and faint fire.7 These are some of the ideas on meteorology that were dominant at the time of the Quran’s revelation, fourteen centuries ago. (1) See The Atmosphere, Anthes and others, pp. 268-269, and Elements of Meteorology, Miller and Thompson, p. 141. (2) The updrafts near the center are stronger, because they are protected from the cooling effects by the outer portion of the cloud. 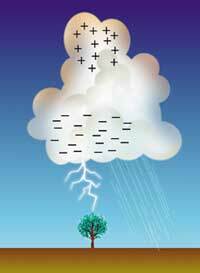 (3) See The Atmosphere, Anthes and others, p. 269, and Elements of Meteorology, Miller and Thompson, pp. 141-142. (4) See Ee’jaz al-Quran al-Kareem fee Wasf Anwa’ al-Riyah, al-Sohob, al-Matar, Makky and others, p. 55. (5) Elements of Meteorology, Miller and Thompson, p. 141. (6) Meteorology Today, Ahrens, p. 437. (7) The Works of Aristotle Translated into English: Meteorologica, vol. 3, Ross and others, pp. 369a-369b.